The study shows what New York subway riders are eating, including takeout pizza, chickpeas and kimchi. Weirdly, cucumber DNA "was the third-most prevalent found from more complex organisms," reports the Washington Post. Antibiotic-resistant microbes turned up in 27% of samples, but overall only 12% of found bacteria can be linked to disease. 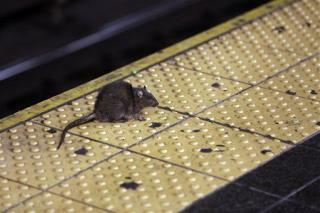 Three stations had "traces of the bacteria that cause bubonic plague," likely caused by rats, says the Journal. But there hasn't been a plague case in New York City for 12 years, the CDC notes. E. coli showed up in 56 stations and bacteria linked to food poisoning in 215 stations. What doesn't kill you will truly make you sick to your stomach ! ! ! What click bait this article is. There are 10 times more foreign cell is your body than human ones. So you are more bacteria than you are you. We are all walking petri dishes. From our skin to our gut we have bacteria. You really want to get grossed out, pull a hair from your eyebrow and look at under a microscope. Meh. That which doesn't kill you, makes you stronger.